Gloria Solorzano de Lopez, born in Caracas-Venezuela, studied at La Universidad Central de Venezuela and earned a B.S. degree in Computer Science. 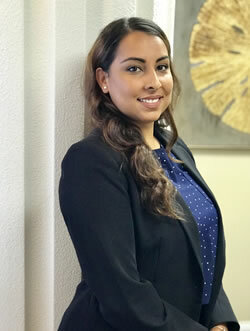 Mrs. de Lopez has been working with immigration attorneys as a legal assistant since she arrived in the United States of America eleven years ago. Orlando Attorney Nayef Mubarak and Mrs. de Lopez have worked together since 2012. After a career in computing and bank auditing, Mrs. de Lopez determined that cold world surrounding auditing and computing systems was not her passion. Mrs. de Lopez had a calling to interact with people, listen to their needs, and the passion to help them. 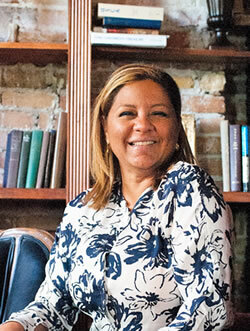 In 1999, motivated by this passion, Mrs. de Lopez took the opportunity to run her own business in a crowded shopping mall in Caracas-Venezuela, specialized in women’s fashion. She led the business for seven years and that experience enabled her to keep in touch with people constantly and understand the human need to be heard and recognized. By the end of 2005, a wonderful door was opened for her and Mrs. de Lopez arrived in the United States, settling in the state of Florida. Mrs. de Lopez started working in a law firm where she discovered an interest in the U.S. legal immigration system. Since then, Mrs. de Lopez has been acquiring knowledge into the larger world of the immigration laws, supporting those who have emigrated to the United States of America from around the world. Mrs. de Lopez loves interacting with individuals who have different cultures, languages, beliefs and life goals. In 2012, attorney Mubarak offered Mrs. de Lopez the position to be his legal assistant at the law firm of Mark NeJame. Since then, both attorney Nayef Mubarak and Mrs. de Lopez started to lay the foundation of a great team with the professionalism, mutual respect, and an ever-present sharing of every case from beginning to end. This great teamwork led attorney Mubarak to offer Mrs. de Lopez the opportunity to accompany him on his new project, his own law firm: Mubarak Law. By the end of 2016, both began to lay the project’s foundation, sharing the same values and principles which have always been displayed in their work. They committed to fulfilling the daily goal and their main priority, the future of every immigrant. Nowadays, along with new members of the Mubarak Law team, they work tirelessly to achieve the goals of Mubarak Law, which are the goals of their clients’. Sare Rodriguez was born in the Dominican Republic. Her family moved to New York City when she was just a baby. Growing up, she was fascinated by the different cultures all around her. She completed high school at the top of her class in just three years. Sare later received her bachelor’s degree in English Literature with a minor in Sociology from York College in Queens, NY. While she loves literature, she always knew that a career in law was where she belonged. Upon graduating college, she began working in a boutique law firm in Midtown Manhattan. She later went on to work as a paralegal at a prominent NYC firm handling Intellectual Property matters. After a few years of working as a paralegal, Sare decided it was time to take her career to the next level and began her law school journey. She later moved to Central Florida and is currently in her final year of law school at Florida A&M University College of Law. She is also President and Founder of the Tax Law Society at FAMU Law. Sare enjoys a good book and her free time is usually spent with her family exploring the beaches Florida has to offer. She hopes to use her law degree to help give back to her community and improve the quality of life for clients.